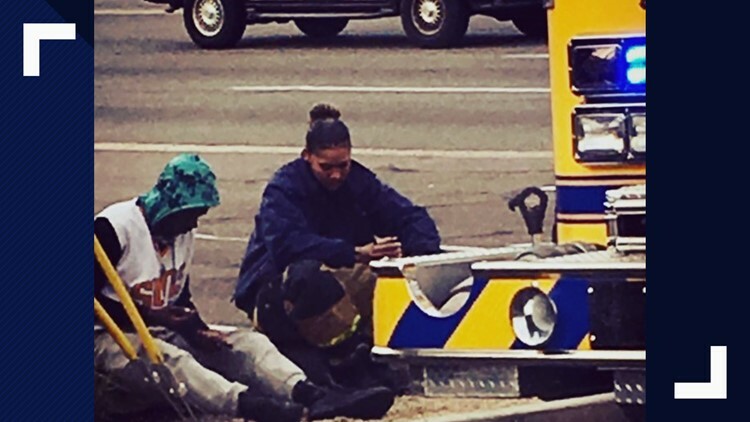 Photo shared on Glendale Fire Department's Twitter shows firefighter Alex Mathews giving a homeless person her shoes. Firefighter Alex Mathews set a wonderful example. PHOENIX — Some tasks done by first responders go unnoticed. Their good deeds are not always documented, but Glendale Fire Department shared a photo of one of their firefighters showing kindness to a man in need. While on a call, firefighter Alex Mathews learned that the patient she was treating was homeless and didn’t have shoes, the Glendale Fire Department tweeted Sunday. The tweet goes on to explain that Mathews changed into her bunker pants and boots so that she could give the man her personal pair. "Too good not to share," the tweet reads.